I am Yam. Yam I am. So a regular reader asked me the question “Do you know the difference between a Yam and a Sweet Potato?” I thought I did… but when I researched it, I found out that I was sort of wrong . Do you know the difference? If not… read on! 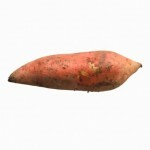 There are only about two types of sweet potatoes… white skinned and orange skinned (though there are several varieties). If the tuber has an end that tapers to a point, it’s a sweet potato. Yams have rounded ends. What’s that you say? But grocery stores in this country label the orange-skinned, pointy-ended potatoes yams. Is that wrong? YES. Several decades ago, in order to differentiate between the original white-skinned (and less sweet) variety and the more readily available orange-skinned variety, sellers started labeling the latter “Yams”. As in candied yams. However, Yams and Sweet Potatoes aren’t even in the same family! The are both tubers… but that’s about it. 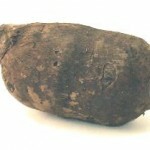 The sweet potato is found in tropical America and is part of the morning glory family. The light-skinned variety has a taste and texture more reminiscent of a standard baking potato and the orange-skinned variety is more sweet and moist. What we eat in the US? Sweet Potatoes. The true Yam is also a tuber and the bulb of a tropical vine — and is not traditionally found in the US (but has over 150 varieties). It is more often found in Latin American, African and Caribbean markets and locales. It can be anywhere from the size of a regular potato up to 7 feet long (and over 100lbs)! The skin can be anywhere from off-white to dark brown and the flesh from white to pink to purple! It is also sweeter and more moist than a sweet potato. Have you ever cooked a yam? Probably not.